Many people like to try DIY projects at home and if you are just getting started on one it’s good to know some tips to make sure your work environment is safe. People regularly ask our Hubbies to help out maintaining decks and pergolas, carports, ramps, installing door handles and locks, window repairs, assembling of bookcases, laying floor boards and general repairs and maintenance because we know what we are doing. This week our Hubbies are sharing their top tips for safe carpentry practices and the basic steps to get you started on a job around your home. The first thing you will need is to invest in some basic hand and power tools. It’s important to buy good quality tools and this doesn’t necessarily mean they have to be expensive, but investing in reliable, top notch tools saves you money in the long run as you will need fewer replacements and produce better quality work. 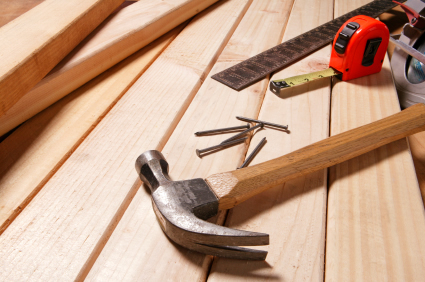 Before you attempt any carpentry work make sure you have familiarised yourself with your tools. If used incorrectly, your power tools pose a serious safety threat. Knowing your way around your tools is safer and more efficient. It’s a good idea to practice first on some spare wood for example. Don’t reach over a blade. After the blade has stopped use a push stick, rather than your hands, to move any scraps out of the way. The most basic and important rule to remember with your work is to measure twice and cut once. Successful carpentry is about accuracy and experience. Practice makes perfect and will determine the quality of your work. Carpentry, even at a basic level, requires knowledge that comes with experience and you’ll be required to use tools that pose a danger if used incorrectly. If you’re not confident in your level of expertise, leave it to the professionals and give Hire A Hubby a call on 1800 803 339 or visit www.hireahubby.com.au for more information.